50037 cab We have acquired the number 2 end cab off 50037. It was previously purchased from MC Metals and taken to the SRPS at Boness. Its planned restoration was never completed and hence it became available for disposal. The main reason for purchase is to acquire its contents for spares and re-use but it is destined for restoration and mobile display in the future. 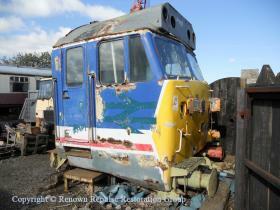 We have acquired the number 2 end cab off 50037. It was previously purchased from MC Metals and taken to the SRPS at Boness. Its planned restoration was never completed and hence it became available for disposal. 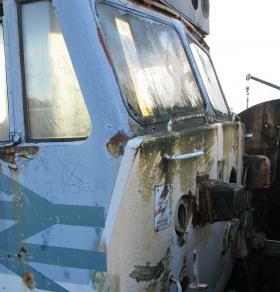 The main reason for purchase is to acquire its contents for spares and re-use but it is destined for restoration and mobile display in the future. 50037 cab at Bo'ness 6th May 2010 The first working party at Bo'ness took place on 50037 over four days 6th-9th May 2010. Initial work saw the thorough cleaning of both inside and out to remove much algae and dust. 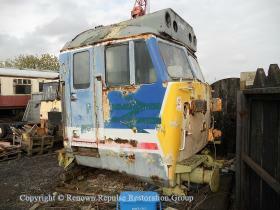 Rubbish was cleared out from the inside and the various parts that came with the cab were accumulated and stored. Numerous parts were refitted to save space; namely all the AWS equipment and the missing secondman's handrail. The SRPS steam dept kindly lent Whitworth taps and dies so we could prepare the studs to receive a replacement buffer long since re-used on 37025. 6th May 2010. 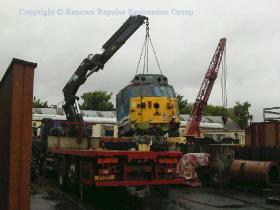 The first working party at Bo'ness took place on 50037 over four days 6th-9th May 2010. Initial work saw the thorough cleaning of both inside and out to remove much algae and dust. Rubbish was cleared out from the inside and the various parts that came with the cab were accumulated and stored. Numerous parts were refitted to save space; namely all the AWS equipment and the missing secondman's handrail. The SRPS steam dept kindly lent Whitworth taps and dies so we could prepare the studs to receive a replacement buffer long since re-used on 37025. 6th May 2010. 50037 cab at Bo'ness 26th May 2010 Boness work party. Tools and paint were taken North for the second session on 50037 over 26th and 27th May. It has been decided to re-skin below the droplights as the usual rot is rampant as expected. The roof is good however and a start was made on corrosion treatment and paintwork. Lack of power thwarted too much progress so it has been agreed to re-locate the cab opposite the MPD to assist repairs. To this end, Steam dept to the rescue again they lent us a buffer to aid hiab lifting of the cab. It was not possible to arrange the lorry but the new site was cleared and graded ready. 26th May 2010. Boness work party. Tools and paint were taken North for the second session on 50037 over 26th and 27th May. It has been decided to re-skin below the droplights as the usual rot is rampant as expected. The roof is good however and a start was made on corrosion treatment and paintwork. Lack of power thwarted too much progress so it has been agreed to re-locate the cab opposite the MPD to assist repairs. To this end, Steam dept to the rescue again they lent us a buffer to aid hiab lifting of the cab. It was not possible to arrange the lorry but the new site was cleared and graded ready. 26th May 2010. 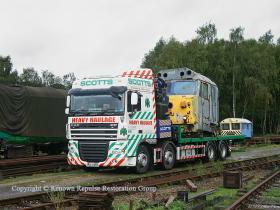 50037's cab is seen being moved into a more convenient position on the SRPS site at Boness In June 2010, a hiab lorry went into Boness and relocated the cab to outside the MMPD. Thanks to Graham and Matt on site for overseeing the lift. 8th June 2010. In June 2010, a hiab lorry went into Boness and relocated the cab to outside the MMPD. Thanks to Graham and Matt on site for overseeing the lift. 8th June 2010. 50037 Illustrious cab arrives at Rowsley Just over 24 hours after the initial telephone call to Scotts Heavy haulage 50037's cab arrives at Rowsley, at the end of what must be one of the most hurriedly-arranged transport moves ever. We had originally intended keeping the cab at Boness for some time, but unfortunately developments at the SRPS site meant that the space the cab was standing on was required for some building works and we were asked if we could move it. As such we contacted Scotts on the 2nd to ask if they had a lorry going anywhere near Boness in the next few weeks that we could use as a back haul to keep costs down. The unexpected answer was "We've got one on it's way back from Aberdeen now, I'll just find out where he is." Followed by, "He's on the Edinburgh bypass can we collect it now?" Unfortunately this was the only lorry they had in the area for well over a month, so we had little choice but to jump to it, making hurried arrangements with the SRPS, Peak Rail, Scotts and the Class 37 Loco Group who also had some spares to come south. Fortunately with everyone's understanding and assistance the arrangements were made and the move went extremely smoothly. 11th September 2010. Just over 24 hours after the initial telephone call to Scotts Heavy haulage 50037's cab arrives at Rowsley, at the end of what must be one of the most hurriedly-arranged transport moves ever. We had originally intended keeping the cab at Boness for some time, but unfortunately developments at the SRPS site meant that the space the cab was standing on was required for some building works and we were asked if we could move it. As such we contacted Scotts on the 2nd to ask if they had a lorry going anywhere near Boness in the next few weeks that we could use as a back haul to keep costs down. The unexpected answer was "We've got one on it's way back from Aberdeen now, I'll just find out where he is." Followed by, "He's on the Edinburgh bypass can we collect it now?" Unfortunately this was the only lorry they had in the area for well over a month, so we had little choice but to jump to it, making hurried arrangements with the SRPS, Peak Rail, Scotts and the Class 37 Loco Group who also had some spares to come south. Fortunately with everyone's understanding and assistance the arrangements were made and the move went extremely smoothly. 11th September 2010.